Oh man I have been so excited to share this shoot with you. I know steampunk styled shoots are nothing new but I can’t help but feel a little excited when I see suppliers creating their own unique version of the theme. I absolutely adore the location of this shoot which took place at the exclusive Horsebridge Station in Romsey. The beautiful disused Victorian station, with views of the River Test set in the Hampshire countryside have provided the perfect backdrop. The shoot was organised by suppliers from the Hampshire Wedding Supplier, a directory full of suppliers which is part of The Wedding Gateway network. All the suppliers were so enthusiastic about this shoot and their fabulous work really has allowed the theme to take on a life of its own. Each person’s style and products were harmoniously fused and created a visually stunning outcome. 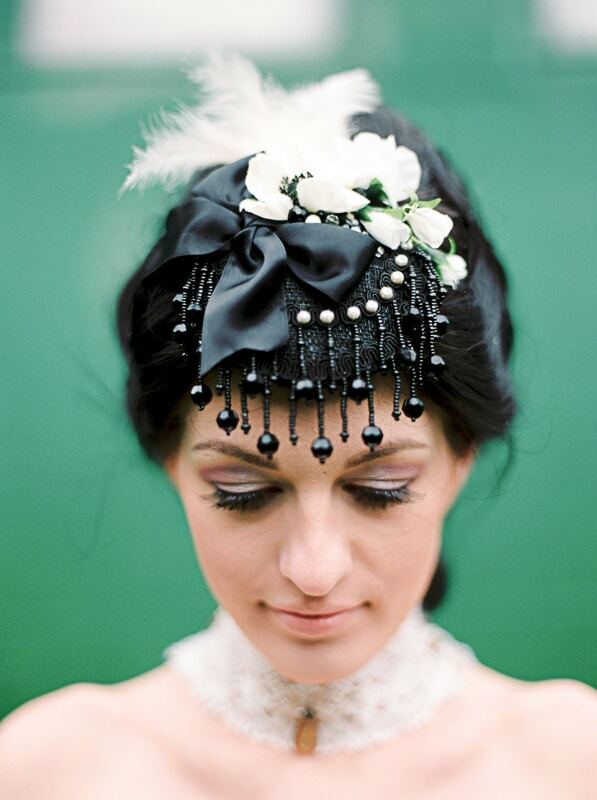 Many of the products, from the hot air balloon biscuits to the beautiful fascinators and jewellery, were designed and handmade specifically for the shoot, making it truly bespoke and inspirational. We wanted to emulate the decadent victorian era, using gold and copper metallic tones which gave a nod to the obvious steampunk influence of the shoot. We also used Plums and Pinks to soften the theme and add a useable and feminine aspect. A delicate hanging ribbon chandelier with handmade vintage style air balloons, worked perfectly as a textural backdrop helping to set the scene but we thought it would look equally amazing as an alternative hanging decoration over guest tables. We created individually made baggage tag name cards to add a travel element to the table décor. Bijou Junkie jumped at the chance to create an exclusive range of steampunk inspired pieces after recently completing some steampunk items for her web site. Each incorporated watch mechanisms as we thought there was no better way to show you’ll love someone until the end of ‘time’. Get it…. Each had its own steam punk inspired quirky name and the range is now available to purchase for brides who like something a little different. We asked Blue Blossom Wishes to design an invite to compliment the steampunk travel theme, which she will confess was not her usual style at all however she thoroughly enjoyed the challenge. We used flowers such as Roses, Peonies and ferns to soften the steampunk styling and add an organic, romantic feel. Annette from Elegance Bridal Coiffure was responsible for the hair and makeup. The steampunk style we were looking to create was a cross with Victorian and punk which demonstrated the full potential for the hair. Big, dramatic but still pretty with lots of back combing and curls. The makeup was deliberately dramatic with long lashes and seductive red lips. In contrast we also created a style that was more classic soft dainty up style more traditional for a bride, with lilacs and pinks. Now you can see why I was so excited can’t you?! The pleasure was all ours Sian, we loved it!!! I found this post while searching for Steam Punk and wow! Love the style. This is awesome inspiration. Thanks so much for this post (there aren’t many online about this theme believe it or not).